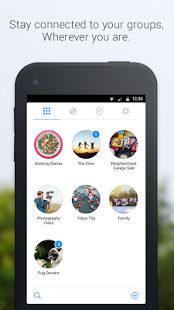 Facebook Groups is an Android app developed by Facebook. Others apps created by Facebook are: Adverts, F8, Facebook, Facebook Mentions, Moments, Facebook Messenger, Facebook Pages Manager, Hello, Selfied, Events from Facebook, Sound Clips for Messenger, Stickered for Messenger, Strobe for Messenger, Work, Work Chat, MSQRD. Facebook Groups first became available on 18 Nov 2014. Facebook Groups has been awarded with the "Top Developer" badge. It is estimated that Facebook Groups has been downloaded between 10000000 and 50000000 times from the Play Store. Allows an app to access approximate location. Alternatively, you might want ACCESS_FINE_LOCATION. Allows an app to access precise location. Alternatively, you might want ACCESS_COARSE_LOCATION. Allows an application to request installing packages. Apps targeting APIs greater than 22 must hold this permission in order to use ACTION_INSTALL_PACKAGE. Mentions is a better way to share and stay in touch with your fans on Facebook.